Click on the subscription in question. At the bottom of the subscription page you will find the License Keys box with the product licenses. To create a sublicense, click Create License Key. Dynamic allocation enables users of a sublicense to use allocated licenses as needed. Unused licenses remain in the main license pool, which is linked to the main subscription license key, and can be distributed from there to other sublicenses. Reserved allocation allows reserving all the allocated licenses exclusively for this particular sublicense. Non of the licenses (including unused ones) are available in the main license pool, which is linked to the main subscription license key, or in other sublicenses. Click Save to finalize creation of the license. To edit properties of a particular sublicense, click on the cogwheel icon next to the sublicense in the License Keys box. Make your changes and click the Save button. You may use the sublicense key or give it to an admin of particular team within your company or organization to activate the corresponding Parallels product. To delete a sublicense, click on the cogwheel icon and then on Delete. The number os seats allocated to the removed sublicense will be returned to the primary license. 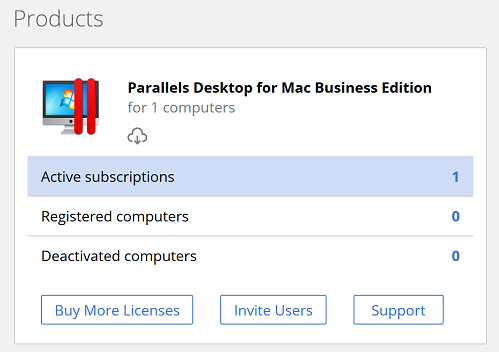 To learn how to purchase additional product licenses in an existing business subscription, see Purchasing additional licenses in a Parallels business account.